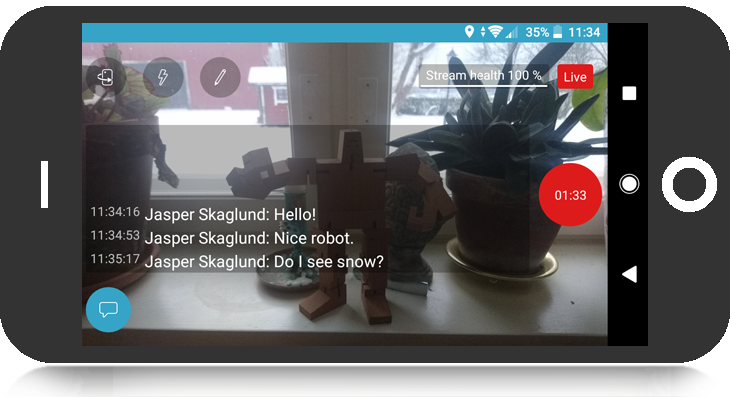 The Bambuser Broadcaster App is our turnkey app for going live from any smartphone, here are some tips on how to use it for Android. Start off by downloading the Bambuser Broadcaster App from the Google Play store. 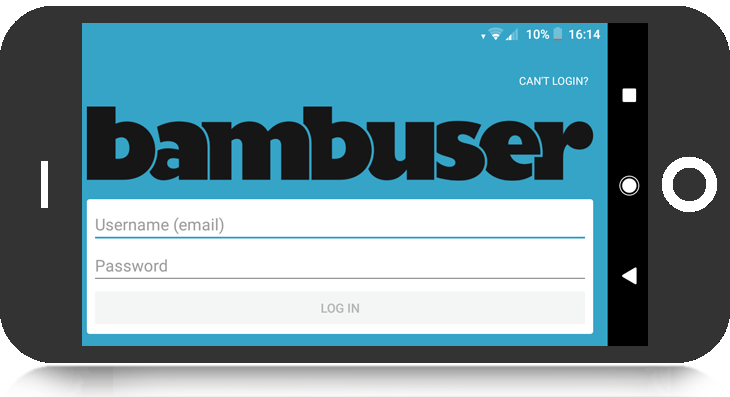 If you do not have a Bambuser account already you can sign up for a free trial. Once the app is installed and ready you will be asked to log in with the email and password you signed up with. You will remain logged in until you manually log out from the app. The app is supported on Android 4.0.3 and newer. 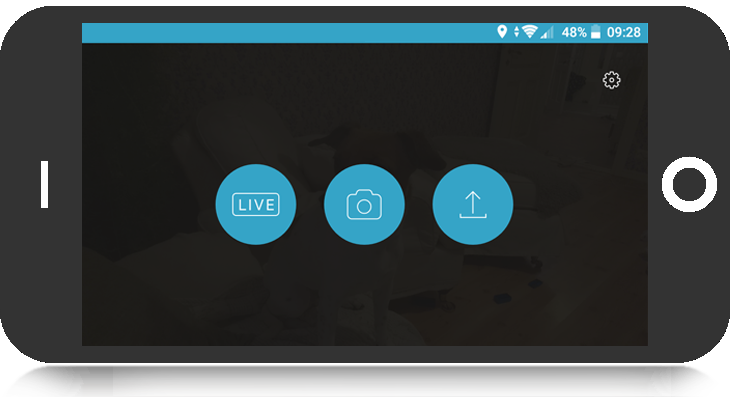 With the Bambuser Broadcaster App you can stream live videos, take photos and upload pre-recorded content. All your content will be accessible in the Content Manager associated with your team. 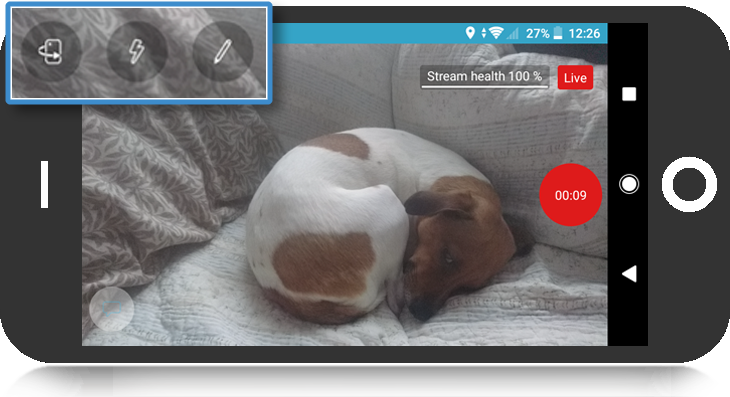 To start a live stream simply tap the “Live” label on the starting interface. Hold the device in landscape mode and press the round red button to start broadcasting. A “Live” label and duration counter will indicate that you are up and running. Sometimes you may want to broadcast live in a lower resolution to get a smoother live experience, for instance when broadcasting in poor network conditions. In these cases a parallel local HD recording of your live stream can be saved to the camera roll. In this way you can make sure not to miss out on the live situation and still have a high quality video to be watched on demand. To enable this go to “Settings” on the starting interface and activate “Record”. Make sure there is sufficient storage available on your device. Generally, with “High Quality” enabled 30MB/minute is being saved, meaning you can record approx 30 minutes with 1 GB storage. Local HD recording is supported on all devices with Android 6.0 or higher and on some older flagship devices. To take a photo tap the camera icon on the starting interface followed by the round white button. If you are happy with the shot and want to upload it, tap the thumbnail in the bottom left hand corner. Set your title and finally press “Upload” to send the captured photo. Tap the upload icon on the starting interface and then click the “Choose file” button to select an earlier captured video or photo from the camera roll, add a title and press “Upload”. Please keep the app open while uploading. Disclaimer: We strongly recommend using a headset to avoid acoustic feedback. The Content Manager operator can start a call by initiating an audio talkback request from the Content Management interface. The user of the Bambuser Broadcaster app will get a notification on the screen, asking to accept or reject the request. To close an active audio talkback session, simply tap the red phone icon which appears in the bottom right hand corner of the viewfinder. Enable Talkback Mix-in under “Settings” to record the incoming talkback audio into the live broadcast. If you have local HD recording enabled the incoming talkback audio will also be included in this video file. Talkback supports Android 4.1 and newer. The Content Manager operator can send messages via the chat function available directly in the Content Manager. The app user will be notified of any messages by a little circle on the chat icon placed to the bottom left. To toggle the “chat” view simply press the “chat” icon. Note that this is a one-way communication and read-only for the app user. Tap the rotate camera icon to toggle between front- and back facing cameras. The live stream will not be interrupted with this action. For streaming in darker environments, tap the flash icon and the flashlight will be lit in continuous mode. Tap again and the light will be turned off. 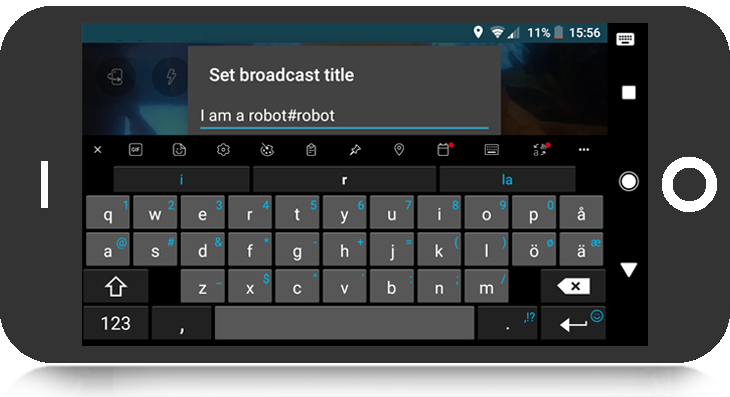 Tap the pencil icon to set a title to the broadcast. Zoom the video with two fingers directly on the screen. All settings are pre-set and changes are generally not needed, certain circumstances may however require you to switch or enable a setting. Log out – Shows which account you are currently logged in with. Click to log out. High video quality – Enable this to potentially stream with a higher resolution, up to 720p. Otherwise it will be restricted to 540p in order to use less bandwidth. High audio quality – When broadcasting over a poor network disabling this saves some bandwidth. 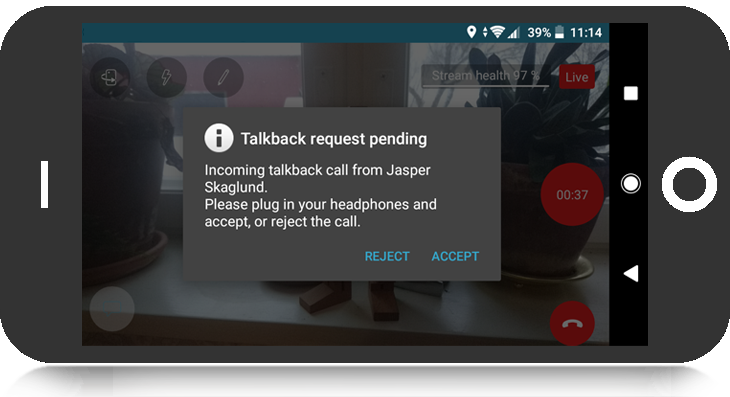 Talkback mix-in – When enabled, the incoming talkback audio is recorded into the live broadcast. If the “Record” setting is enabled, the incoming talkback audio will be included in this video file as well. Record – Enables a locally stored HD version of the video for later uploading. Geotagging – Location data will be sent to the Bambuser servers together with the video. Capture sounds – Enable this to activate the sound that indicates a start of a broadcast or the click when capturing a photo. 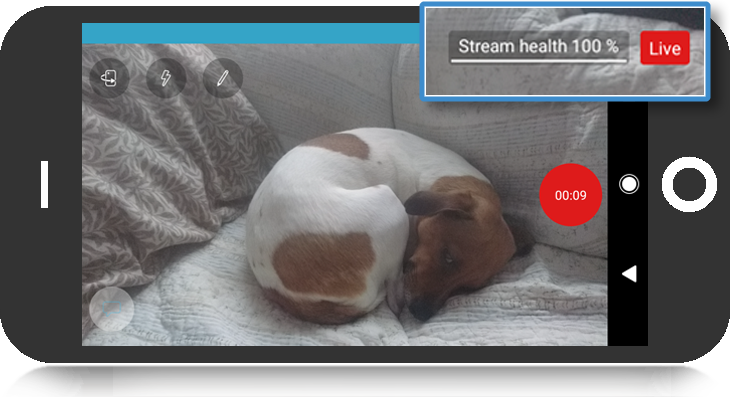 The “Stream health” indicates how the live stream is performing. A stream health around 70-100% indicates that the flow (frame-rate) of the video is good. If the stream health falls below this range for a consistent period, it indicates congestion or data loss in the network and suggests the network may not be capable of providing a healthy live stream. The local HD recording of the stream will not be affected by low stream health. However please note, if the storage of the device runs out, an ongoing live broadcasting may stop with the risk of the recording not being saved to the camera roll. Adding a title and/or tags to a live stream makes it easier for the Content Manager operator to discover and manage incoming material. Input any title/tag in the title field. By adding “#” to any word, a tag is automatically added to the video metadata. For example, “#robot” will result in the tag “robot”. Setting tags in the title field is currently not available for image uploads.